Carol Christine Hilaria Pounder (born December 25, 1952) is an American film and television actress. 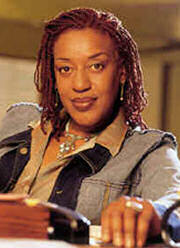 She is usually billed as CCH Pounder (or C.C.H. Pounder early in her career). She has appeared in numerous films, made-for-television films, television miniseries, and has made guest appearances on notable television shows. Pounder was born in Georgetown, Guyana to Betsy and Ronald Pounder. She was educated in England and moved to the U.S. in 1970. Pounder made her acting debut in the 1979 film All That Jazz. Pounder starred in the film Bagdad Café (a role played by Whoopi Goldberg in a short-lived television sitcom). Pounder has made smaller appearances in many other successful films. She has focused primarily on her television career. In the early 1980s, Pounder first appeared in guest roles on Hill Street Blues, and then on several other popular shows (Miami Vice, L.A. Law, The X-Files, and Quantum Leap) before landing a long-running recurring role on ER from 1994 to 1997. She then returned to guest appearances on other shows, including The Practice, Law & Order: Special Victims Unit, Millennium, The West Wing (where she was considered for a lead role) and the short-lived sitcom Women in Prison. Since 2002, she has starred as Detective Claudette Wyms in the FX Networks police drama The Shield. For this role she was nominated for an Emmy Award for Outstanding Supporting Actress in 2005. She had previously been nominated for Emmys in 1995 (for guest starring in The X-Files) and in 1997 (for her supporting role on ER). She has also lent her voice to several video games and animated projects, including Aladdin and the King of Thieves, Gargoyles as Desdemona/Coldfire, and most recently Justice League Unlimited as Amanda Waller. Pounder is married to Senegalese anthropologist Boubacar Kone. The couple were married in an African ceremony in Dakar, Senegal and were again remarried at a traditional Los Angeles, California event six months later. Kone is the founder of The Boribana Museum in Dakar, Senegal for the study of cultures of the African diaspora. Pounder used to own a jewelry shop called Banji Girls with her business partner Conni Marie Brazelton but now she sells jewelry through requests via her website cchpounder.com.